Happy hump day, dear readers! I have absconded once again with the hubby's computer and am hanging out at Starbucks so I can get some writing done in peace without a toddler crying at me, for me, or tattling on his brother to me. Even going into my swatch room doesn't guarantee me uninterrupted time right now so I'm letting the husband deal with the crazy until just before bedtime. Mwahahahaha! I actually don't get away from the kids much on a regular basis so I am enjoying the little break and definitely will be doing this more frequently! Now that I've rambled on about #MomLife getting in the way with #BloggerLife, let's get to the actual purpose of this post, shall we? 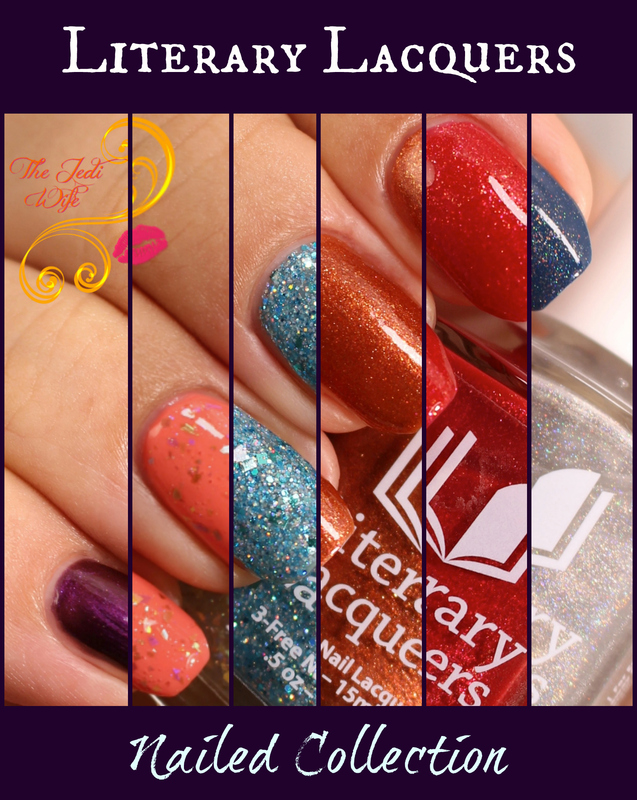 For tonight's viewing pleasure, I have the latest Literary Lacquers Nailed Collection to share with you. 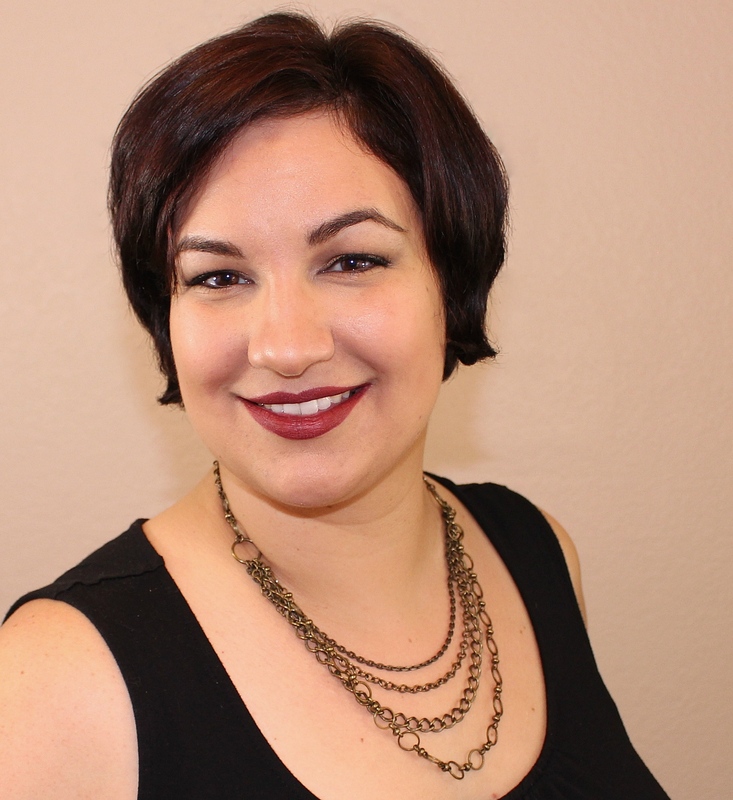 Amy Milder, our favorite erudite creator behind the brand, had partnered up with romance author Opal Carew to create this lovely collection to accompany the release of her latest novel, Nailed. This 5-piece collection boasts lacquers in a surprising variety for such a small collection, and I'm really digging these! Let's check them out! Royal purple to red-leaning magenta multichrome shifting nail polish. Best at three thin coats. Let's just start out with a doozy, at least based on the name. Ha! The collection is based on a romance novel, after all! *wink wink, nudge nudge* I don't know why I never grab multichrome shades often because this shade is stunning! The formula was so perfectly smooth that you might even say the application was orgasmic, at least for the nail aficionados out there that can really appreciate such a thing! Clear base filled with golden and iridescent flakies and clear holo microglitters. To be used in one coat over a base polish. Ah, I just love a good flakie topper! I'm really digging the additional clear holo microglitters added to the combination as well, and this is a great polish for layering! 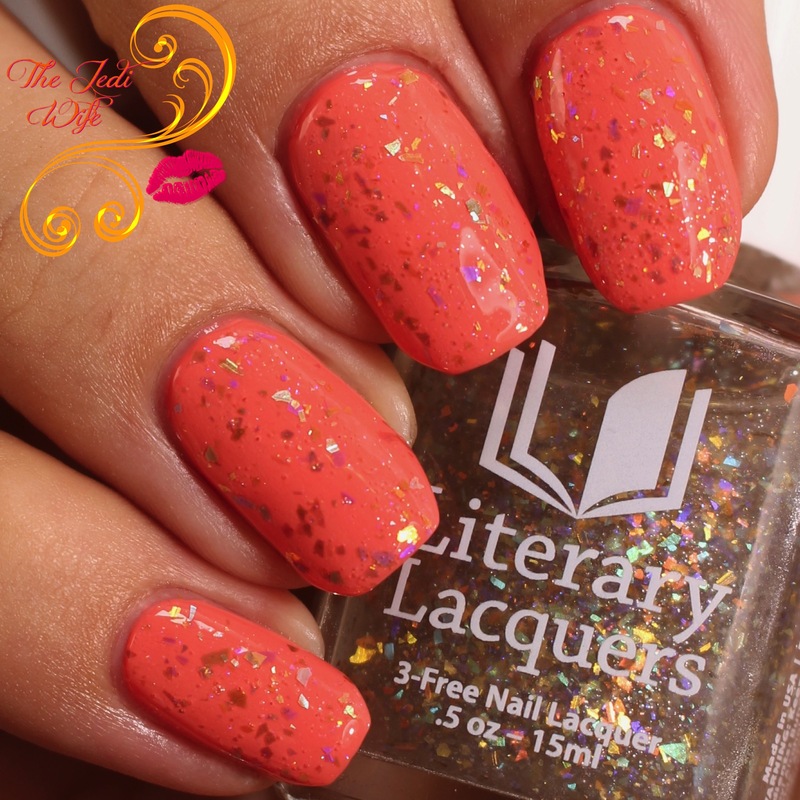 I went with Literary Lacquers' bright coral creme because we all know passion is HOT HOT HOT! This applied really nicely for me, although you do need to be mindful of the flakies as they approach the end of the nail in application. The few random flakies that were sticking out easily pushed back onto the nail, or alternately, you can just pull them off if you prefer. Aqua jelly base packed with aqua square, hex and microglitters. Best at two coats. I admit it, this name makes me giggle like a teenage boy. While I may be mature most of the time, sometimes you just need to let go and have fun! While the description claimes it is best at two coats, I, being the rebel that I am, decided to add a third coat for MOAR glitter coverage. Because IA WANNA glitter! Ha! This was easy to apply, and I had no issues with clumping glitters whatsoever. 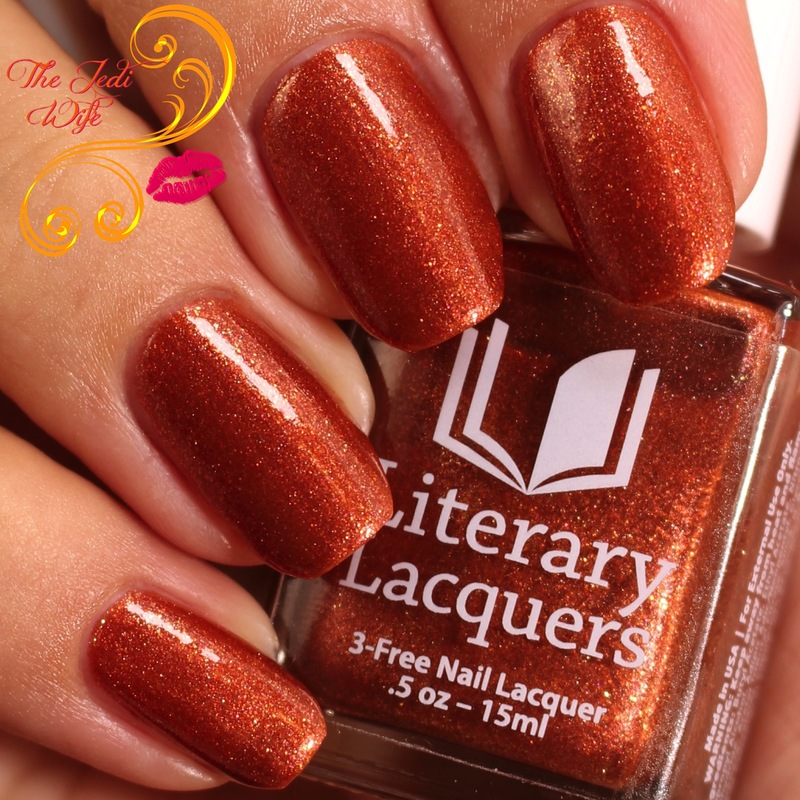 Burnt orange metallic polish with gold flakies and pink shimmer. Best at two coats. Oonffffhhh! This is definitely my kind of colour, and it easily could be named Orgasmic as well! Burnt oranges don't get a whole lot of love, but thankfully it is now fall and the perfect time to wear this! 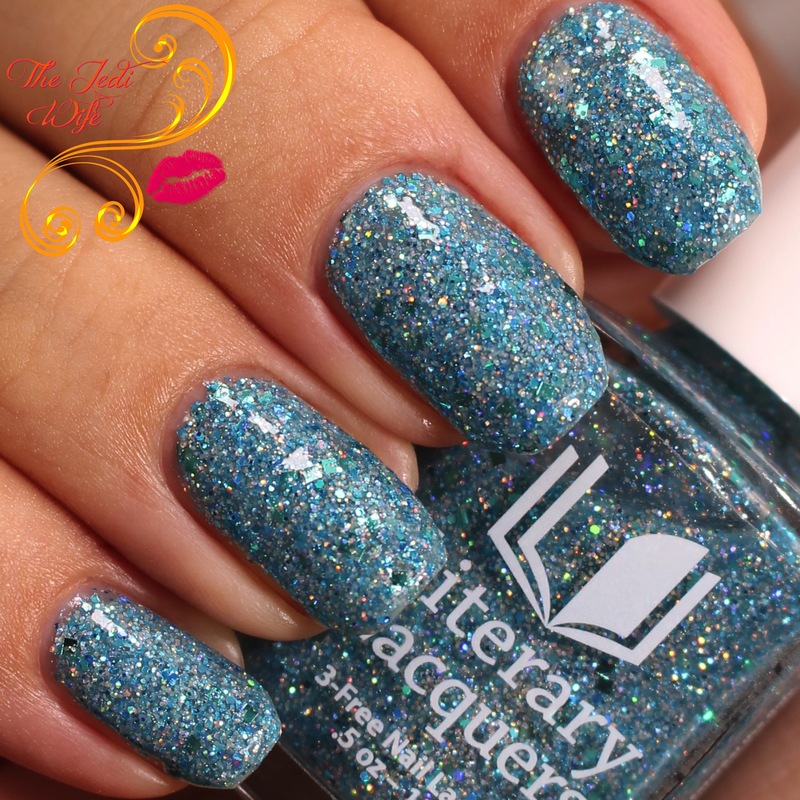 It applied like a dream and is another must have from this collection! Tomato red jelly polish filled with orange, gold and pink glass flecks. 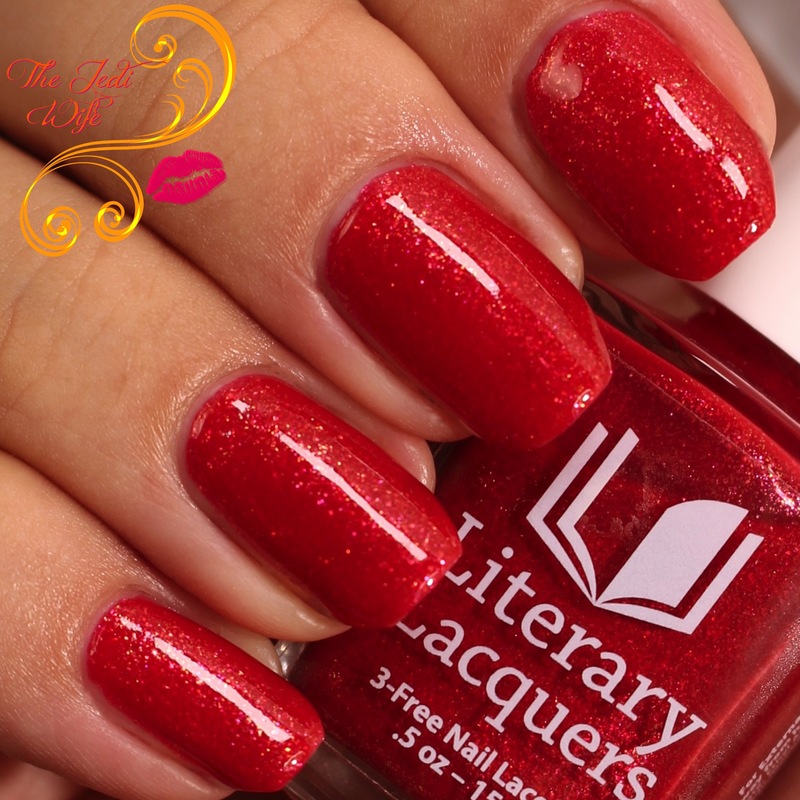 Hot damn, there is no sexier colour than red; add glass flecks to it and OH MY GAH, GET ON MY NAILS NOW! Too much? 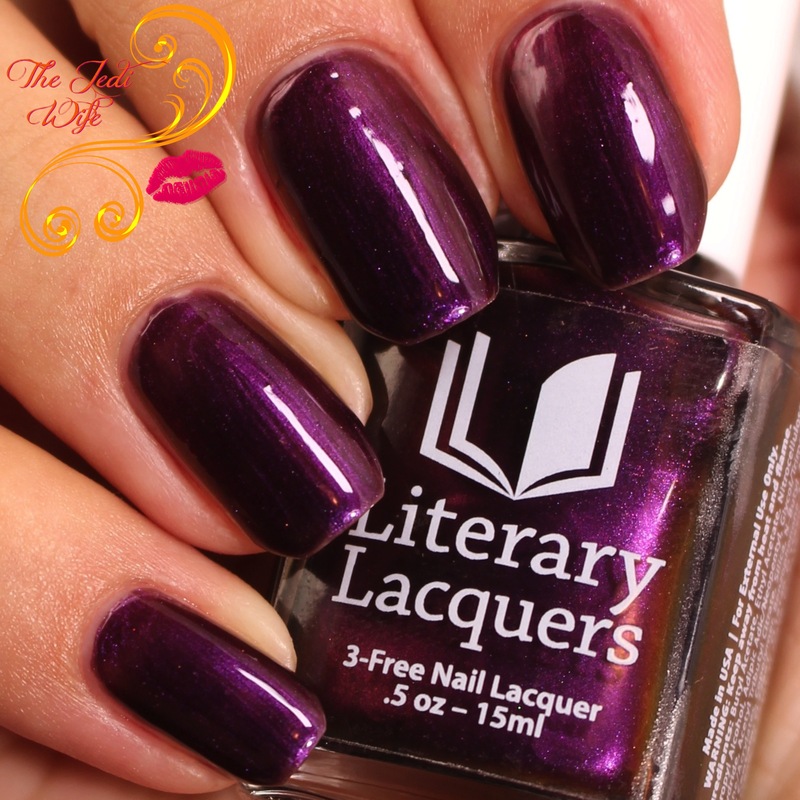 I'm certainly lusting after this shade, and I'm looking forward to wearing this when it gets closer to Christmas. Now if only my inlaws DON'T ask me the name of the colour on my nails..... As far as the formula, I have no issues to report as it applied beautifully like the rest of this collection. 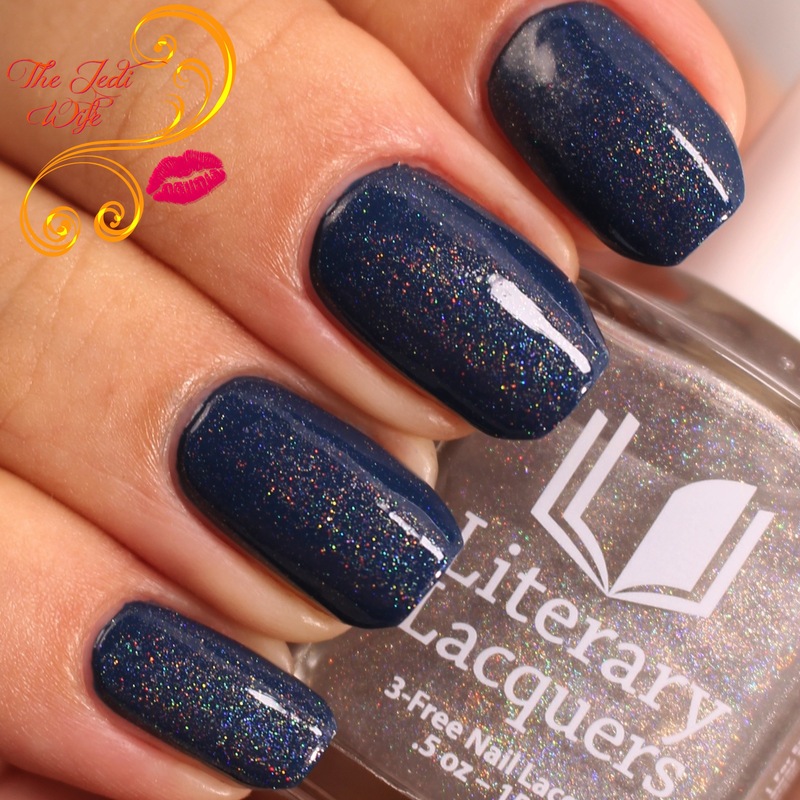 Non-greying liquid holographic nail polish topper with clear holo microglitter. Best used in one coat over base coat. Ah, more of the clear holographic microglitters! They certainly add a nice little pop of something extra with the holo topper! 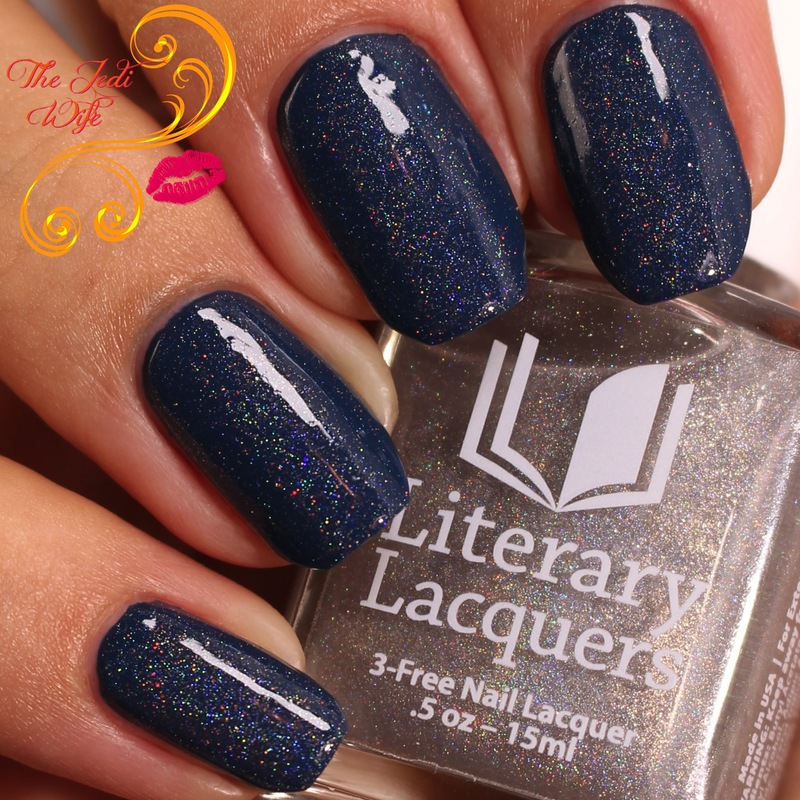 I was actually thinking recently when these microglitters first made an appearance that I really hoped to see them used in this sort of topper, so I am thrilled to have that option in my beloved Literary Lacquers formula! 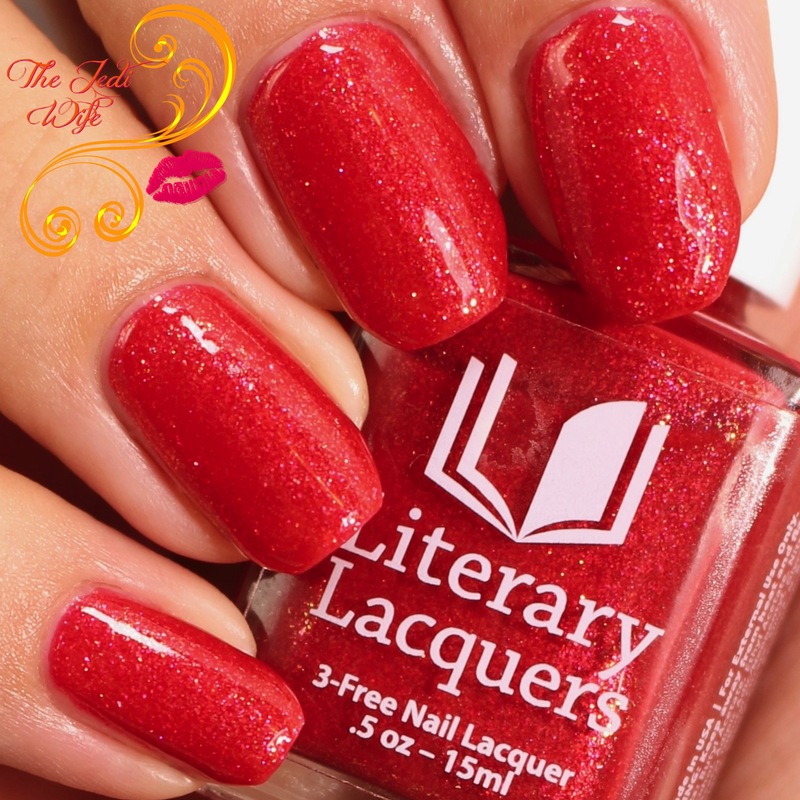 The Nailed Collection and other Literary Lacquers polishes are now available for purchase from the Literary Lacquers etsy shop located here. It is difficult to choose one single favorite or must have from the collection because each shade is so different, between the colour selections and the differing finishes. I'm a fan of toppers since they can go over, well, anything, but the glass flecks of Arousal have caught my attention as well. That being said, I can never turn down an orange, so my thought is just get them all! HA! 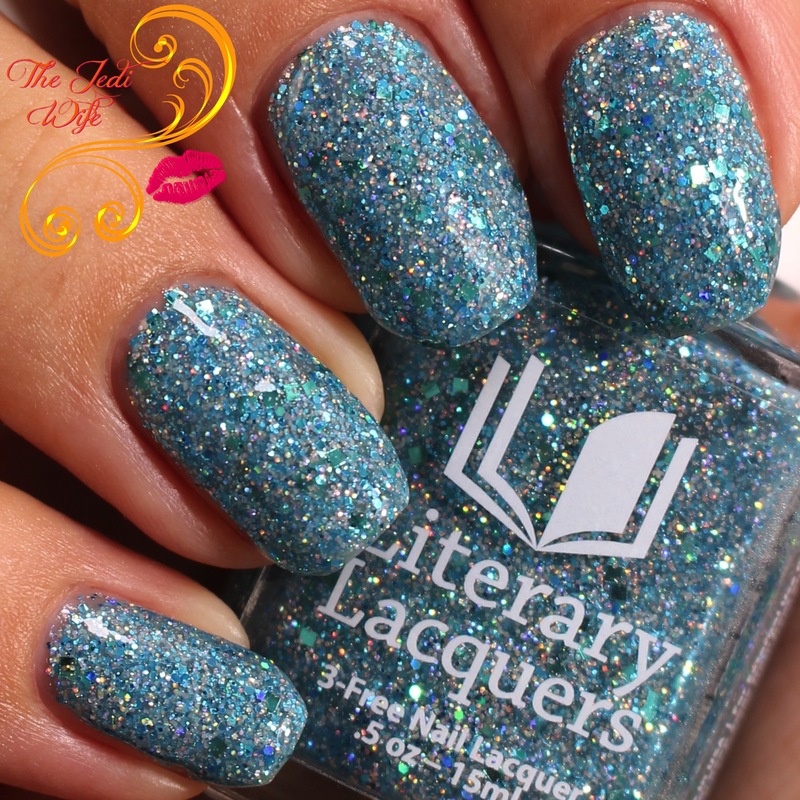 What do you think of the Literary Lacquers Nailed Collection? Do you have a favorite shade? I'd love to hear from you! I went right down this post going "This is my favorite.. No this one is.. oh but that one is awesome too!" Love and Tia Wanna need to be mine! I love After Glow! Great swatches! I always love her polishes. They are gorgeous! Great swatches! I love these polishes but am I the only one a little disappointed by the names? I know they're based on a romance novel, but LL polish names are usually a little more creative. I mig by be obsessed with Tia Wanna just because of the name. Beautiful swatches! I really need to try some of these polishes! Tia Wanna is gorgeous but I must say that combo with the holo top coat is amazing, too! 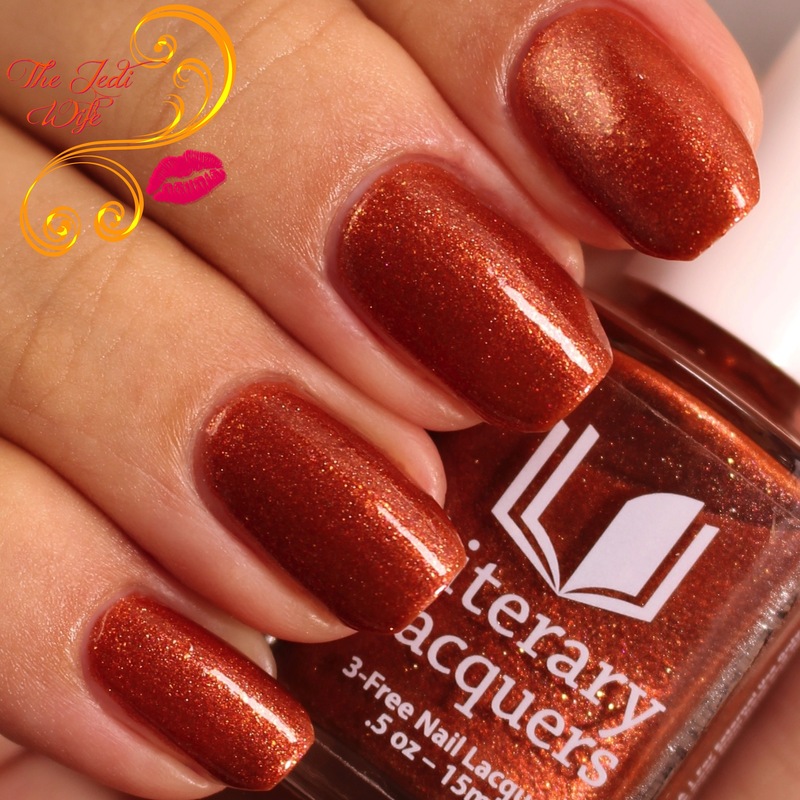 I chose to comment on this post (apropos the Ellagee giveaway) because I love your swatches of Literary Lacquer polishes. I don't see much coverage of this brand on social media, which is a pity. 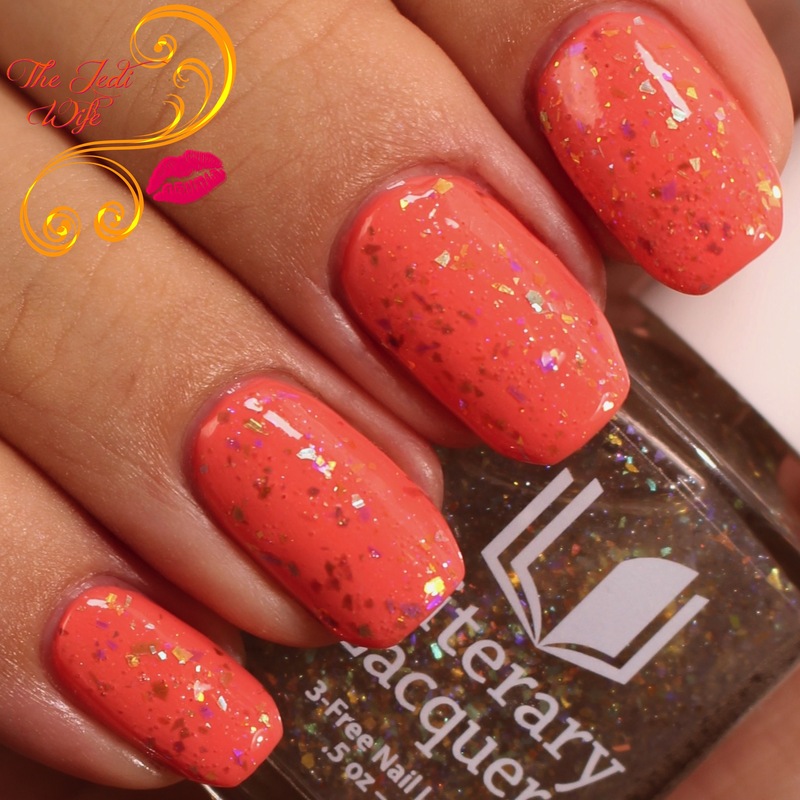 They are lovely colours with such appropriate literary allusions!